Spanish Internet-focused incubator Mola is celebrating its first anniversary, and took the opportunity to release some interesting numbers about its activities, while giving TNW additional details about its plans. As you may remember, we reported last November that Spanish entrepreneur Enrique Dubois and investor Paco Gimena were officially launching a startup accelerator in Palma de Mallorca. At the time, they brought on a joint portfolio of 14 startups and a total investment of 2.8 million euros ($3.63m). Since then, Mola has started to raise external capital, and invested in additional startups in June, followed by a new batch last September. To date, around 4.3 million euros ($5.6m) have been invested in the accelerator, which now boasts a portfolio of 48 startups, supported by 50 employees. Mola also unveiled data about the entrepreneurs it is working with: 80% are men, and their average age is 33.5. As for their projects, they mostly refer to e-commerce (26%), games (18%), B2B services (15%), mobile (12%) and finance (6%). The remaining 26% focus on tourism, health, fashion, media, music and education. Beyond the stats, you may already be familiar with some of its startups, such as Bankimia.com, Workmeter.com, Wayra’s alumnus Emtrics and mobile gaming company PlaySpace, which recently secured a $1.9 million investment round led by PeopleFund. Altogether, these 34 startups estimate that they have generated 189 new jobs, and expect to create 300 in 2013, 600 in 2014 and 1,000 in 2015 – quite an interesting fact considering the crisis Spain is going through. Although the applications Mola received were international, most of the startups it selected are based in Spain, and 40% of its 34 new alumni chose to join its shared offices in Palma de Mallorca. Despite this focus on Spain, Mola also has a global mindset, and has delegations in Palo Alto and in the UK. In addition, it has been eyeing Latin America since its launch, and has enlisted Uruguayan tech entrepreneur Maximiliano De Muro as its head of investments at Mola.com Brazil and Latam. According to De Muro, the acceleration is currently raising a new round of 2 to 3 million euros ($2.6m to $3.9m), most of which will be aimed at financing Mola’s expansion in Latin America. He is been preparing the ground and observing the regional ecosystem for the past few months, and is now gearing up for Mola to open offices in Brazil, most likely in Sao Paulo. 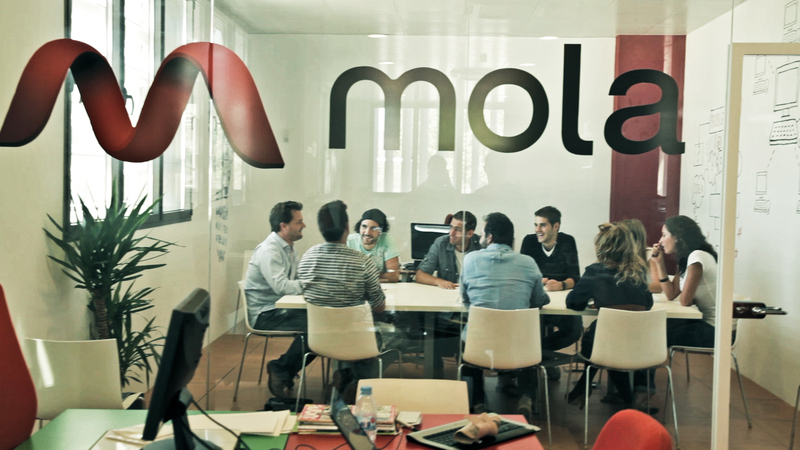 On one hand, Mola is hoping that it will help Spanish businesses conquer new, fast-growing markets. On the other hand, it believes it has the expertise to help Latin American startups expand to Europe via Spain and/or to the US. Still, De Muro insists that Mola will also be looking at helping these companies grow in their home markets if it’s more relevant for them. One thing is for sure, its investments will focus on seed stage companies. To build its local portfolio, Mola will also look for partnerships and co-investments with existing accelerators across the region. At a global level, Mola plans for 2013 include keeping on accelerating companies and helping them to create jobs, while equilibrating its gender ratio by welcoming a growing number of female entrepreneurs.